Select Vistasource → Netfeed → Login to open the login dialog, and then enter your username and password and click OK.
You can edit the RTW Netfeed engine configuration settings to automate the login process. Please see Login for more information. 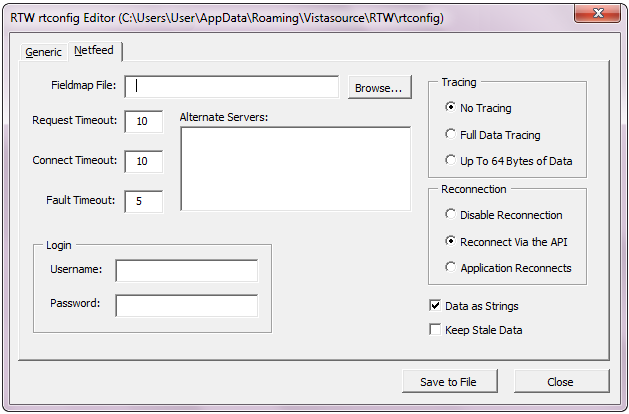 This section provides information about editing the RTW Netfeed engine configuration options using the RTW rtconfig Editor. The options are located under the Netfeed Tab of the Rtconfig Editor dialog, and correspond to those found in the rtconfig file located in the installation directory. To manually edit the RTW Netfeed engine configuration options in the rtconfig file, see Manually Editing the rtconfig File. To edit the RMDS Netfeed rtconfig settings, select Vistasource → Settings → Rtconfig Editor and then select the Netfeed tab. Refers to the rtconfig file option “nf_Fieldmap”, which specifies the location of the field map file. This file is necessary for the mapping of field names to field IDs within the engine. For example, “BID” = 22. A file is provided by default (nf_fields), but any file that adheres to the specified format is allowed. For more information regarding format specification, see the nf_fields file, which is located in the installation directory. Refers to the rtconfig file option “nf_RequestTimeout”, which specifies the time to wait for a response to a request. Any positive value in seconds is permissible. The default is 10 seconds. Refers to the rtconfig file option “nf_ConnectTimeout”, which specifies the time to wait for an initial connection. Any positive value in seconds is permissible. The default is 10 seconds. Refers to the rtconfig file option “nf_FaultTimeout”, which specifies the time to wait between attempts to reconnect. Any positive value in seconds is permissible. The default is 5 seconds. If tracing is on, a message.dat file is created in the current directory. Refers to the rtconfig file option “nf_AlternateServers”, which determines which alternate servers to use on a feed reconnect. Each server name must not exceed 16 characters and must specify either an IP address or a resolvable hostname. The API supports up to 16 alternate servers, which can be specified here by a comma-separated list. Refers to the rtconfig file option “nf_DataAsString”, which specifies whether all incoming real-time data is treated as a string (the Netfeed API provides real-time data as strings). If you prefer to receive numeric data as numeric values, turn off this option. The default behavior is to receive all data as strings. Refers to the rtconfig file option “nf_KeepStaleData”. When this option is on, RTD cells will retain their values even though the engine has been notified that the data is no longer valid (that is, it has become stale). The “data stale” message will still be displayed in the status window. When this option is off (the default), cells referring to stale data will display N/A. The RTW Netfeed engine requires a user to log on to the Netfeed server. This option refers to the “nf_User” and “nf_Password” options in the rtconfig file, where you can enter the login user name and password. If you save the username and password here, the login dialog box does not come up when the Netfeed engine is started. By default, these options are not set.